Miniature compasses back in stock! I've start listing some new miniatures for sale in my store. 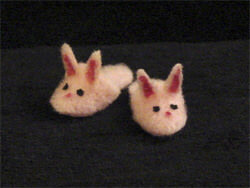 First up, in the spirit of Easter, are handmade fuzzy pink bunny slippers. Just 5/8" (17mm) long, they'd look perfect next to a bed or bathtub! Next, in the spirit of... bunny rabbits?... just what every modern dollhouse needs - a tiny box of condoms to put by the bed! Handmade box measures 3/8" (1cm), and comes with three individual packets that measure 1/8" (3mm) each. The wrappers don't open, but each one has the telltale "ring" made by the contents. 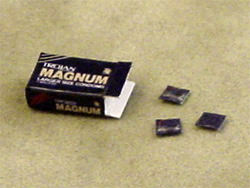 Keep them with the box, or stick one in your miniature man's wallet or woman's purse! Hahahahaah! I laughed so loud ,I got everyone here curious so they all came to see your condoms. :) Very clever! Does it say, "Magnum? Only for the Real Men"
Enhorabuena!!! !, por lo originial y lo bien hecho.